I know that the majority of you believe that Matt Moore will be the Miami Dolphins starting quarterback this year, and I understand why you think so. During the last nine games of the season the Dolphins went 6-3 with him under center. Yes, he did lose three games before that stretch, but once he was on a roll he played really well and led the team on a nice run. Trust me, I get it. Matt Moore gave us hope. 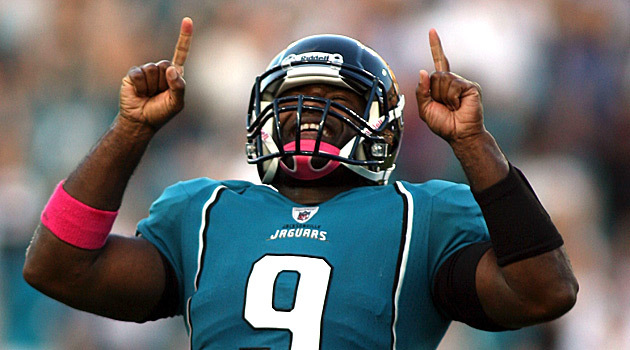 David Garrard wasn't on an NFL team during the season last year, and he is coming off of a back injury. It only makes sense that Moore, who was last year's team MVP, will be the starter this year, right? 1. Garrard will win in practice - No matter how good you think Matt Moore is you have to acknowledge that he isn't a good practice player. Moore has never been great in practices. You can call him a "gamer" all you want. You can argue that all that matters is what happens in the real game, and under most circumstances I would agree with you, but not here. There is no way that Joe Philbin, Mike Sherman, and the rest of Miami's coaching staff can justify starting a player who has been outperformed for the majority of the team's practices and benching the man who has clearly been better. You can say that Matt Moore plays his best game during the regular season all you want, but the fact of the matter is this: if he doesn't show up in practice he won't be able to play in games. Garrard has been performing at a high level in Miami. He has consistently looked like the best quarterback on the team. Matt Moore hasn't. Maybe Moore has looked better than him in a practice or two this offseason, but if you are looking at the whole body of work so far it isn't even close. It's possible that things could turn around and Moore could win the starting job, but don't count on it. Until Moore is able to turn into more than just a "gamer" he won't be able to win. 2. The offense suits Garrard better than it does Moore - Garrard is better suited for, and has more experience with, the West Coast offense, which is the Dolphins offensive system. Matt Moore isn't a West Coast quarterback, and he didn't have to run under a West Coast system last year. It has already become evident in the past two days of training camp. Garrard has just looked like the better quarterback with this offense. Moore has been inconsistent and it is obvious that he is less comfortable with the West Coast system. Garrard has also had exposure to the west coast offense before in Jacksonville. Matt Moore hasn't. You can bet that that will be a factor in the battle between the two. 3. Garrard is more consistent - One thing about Matt Moore's NFL career that has concerned me is that he has never started for a full NFL season. He has had a good stretch with both the Carolina Panthers and the Dolphins, but he has never put together a full season. Garrard, on the other hand, has had an 80+ passer rating every year as the full-time starting quarterback in Jacksonville. He has been to the playoffs (and led a game-winning drive in an AFC Wild Card game). He has been to the Pro Bowl. Sure, Matt Moore has also competed at a high level before, but never with any real consistency. It comes down to this: do you expect Matt Moore, who isn't very consistent, who isn't truly comfortable with the Dolphins offense, and who isn't great at practice, to beat out veteran David Garrard, who is all three of those things? I don't, and I would be very surprised if he does. I also don't want you guys to think that this is me not liking Matt Moore. I do like Moore. I am just looking at this competition realistically, and I don't see how he wins it. Thanks for stopping by. If you haven't already please vote in the poll on the right of this page for who you want the Dolphins to start at QB this year. Feel free to email me at paul@dolphinshout.com. I'm also on twitter @PaulDSmythe. I will try and do a daily count of "wins" in training camp between Moore and Garrard. So far Garrard is ahead with two practices to Moore's zero.